New Gift Basket Designs To Celebrate 2018! We have added sparkly and festive new gift baskets to celebrate the new year. Start their year off in a great way with an impromptu celebration perfect for sharing. 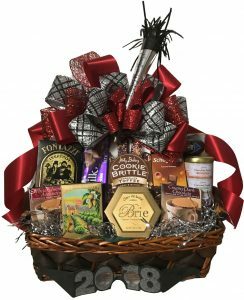 Featured New Year’s Gift Baskets include the Celebration Tray, a beautiful leatherette magazine basket filled with an upscale gourmet assortment, Hidden Surprise stacking boxes, and wine and gourmet baskets. Call or order online today to arrange delivery in January.